MOSCOW, Russia -- Russian President Vladimir Putin remained defiant as Ukraine renewed its pleas Friday for Western military help, accusing Russia of sending in armored columns that have driven back its forces on behalf of pro-Moscow rebels. 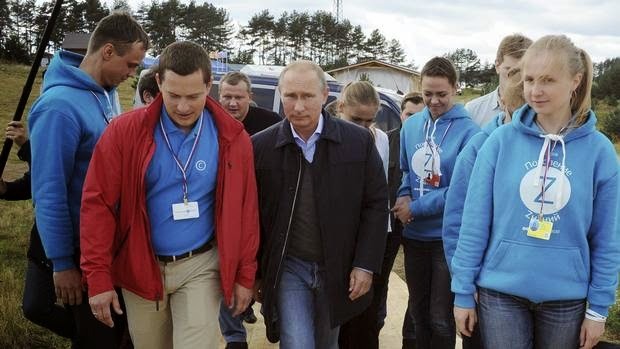 Putin while attending an education forum for students in in Seliger, northwest of Moscow, Aug. 29, 2014. Putin, meanwhile, compared Kiev’s drive to regain control of its rebellious eastern cities to the Nazi invasion of the Soviet Union in World War Two. He announced that rebels had succeeded in halting it, and proposed that they now permit surrounded Ukrainian troops to retreat. He described Ukrainians and Russians as “practically one people,” language that Ukrainians say dismisses the very existence of their thousand-year-old nation. The past 72 hours have seen pro-Russian rebels suddenly open a new front and push Ukrainian troops out of a key town in strategic coastal territory along the Sea of Azov. Kiev and Western countries say the reversal was the result of the arrival of armored columns of Russian troops, sent by Putin to prop up a rebellion that would otherwise have been near collapse. Rebels said they would accept Putin’s proposal to allow Kiev forces, who they say are surrounded, to retreat, provided the government forces turn over weapons and armor. Kiev said that only proved that the fighters were doing Moscow’s bidding. Russia drew a fresh rebuke from French Foreign Minister Laurent Fabius, who told French television station France 24 that Russia could face more sanctions from the European Union. “When one country sends military forces into another country without the agreement and against the will of another country, that is called an intervention and is clearly unacceptable,” he said. In Washington, White House spokesman Josh Earnest said Russia’s footprint was undeniable in Ukraine. “We have regularly marshaled evidence to indicate what exactly is happening, despite the protestations of the Russian government that for some reason would have us all believe otherwise,” he said. Ukraine called on Friday for full membership in NATO, complete with the protection of a mutual defense pact with the United States, putting more pressure on the West to find ways to protect it. So far, the West had made clear it is not prepared to fight to protect Ukraine but is instead relying on economic sanctions, first imposed after Russia annexed Ukraine’s Crimea peninsula in March and tightened several times since. Those sanctions seem to have done little to deter Putin, leaving Western politicians to seek tougher measures without crippling their own economies, particularly in Europe which relies on Russian energy exports. European foreign ministers met in Milan on Friday ahead of a weekend EU summit. They made clear the bloc will discuss further economic sanctions against Moscow. Some said that was no longer sufficient, and other measures to help Kiev should be discussed. Also on Friday Poland denied permission for Russia’s defense minister to fly over its air space after a trip to Slovakia, forcing him to return to Bratislava. Warsaw said he could fly if he reported the status of his plane as civilian rather than military. Moscow still publicly denies its forces are fighting to support pro-Russian rebels who have declared independence in two provinces of eastern Ukraine. But the rebels themselves have all but confirmed it, saying thousands of Russian troops have fought on their behalf while “on leave”. NATO has issued satellite photos of what it says is artillery fielded by more than 1,000 Russian troops fighting in Ukraine. Kiev has released interviews with captured Russian troops. Reuters has seen an armored column of Russian troops on the Russian side of the frontier, showing signs of having recently returned from battle with no insignia on their uniforms. Members of an official Russian human rights body say as many as 100 Russian soldiers died in a single battle in Ukraine in August. Encouraged by state media, Russians have so far strongly backed Putin’s hard line, despite Western sanctions that have hurt the economy, the Kremlin’s own ban on imports of most Western food, and now reports of Russian troops dying in battle. Putin’s lengthy public appearance on Friday and his overnight statement on the conflict appear to be an acknowledgment that the war has reached a turning point, potentially requiring greater Russian sacrifice. Putin answered questions from young supporters, some of whom waved banners bearing his face, at a pro-Kremlin youth camp on the shores of a lake. Wearing a grey sweater and light blue jeans, he looked relaxed but his tone grew intense while he spoke about Russia’s military might, reminding the crowd that Russia was a strong nuclear power. “Russia’s partners ... should understand it’s best not to mess with us,” Putin said. Putin compared Kiev’s assault on the rebel-held cities of Donetsk and Luhansk to the 900-day Nazi siege of Leningrad in which 1 million civilians died, perhaps the most powerful historical analogy it is possible to invoke in Russia. “Small villages and large cities surrounded by the Ukrainian army which is directly hitting residential areas with the aim of destroying the infrastructure,” he said. He said the only solution to the conflict was for Kiev to negotiate directly with the rebels. Kiev has long refused to do so, arguing that the rebels are not a legitimate force on their own but proxies for Moscow, which must agree to rein them in. Ukraine Nazis ? Listen you red devil, you and your predecessors have murdered millions of innocent people in your reign of terror since 1917. Your comrades have killed millions of Ukrainians in the 1930's so if Ukrainians are Nazis, then we look like angels next to you and your criminal leaders. Ukraine hang tough, Ukraine's strength in Unity. We can hear again and again proud statements by Russian officials: Look how tough we are, do not mess with us. That is what happen when you mess with us. But who is messing with Russia? Is there even one Ukrainian soldier on Russian land, who is armed and trying to harm any one? Even though from military point it would not make seance for Ukraine to acquire mobile Nuclear weapons but,I believe Now, Ukraine should. Just for Russia to remember, that their bullying of Ukraine is more dangerous, than the pathetic sanctions, which effected miserable 1% of Russian economy.